Bowls: Leaders beat Brett, but can he topple Popple? Chloe Brett is in action in the Hunts County Finals at Somersham. The finals of the Huntingdonshire Bowls County Championships are being staged on Sunday (July 26) at Somersham, home club of county president Alan Parish. The pressure is off in the mainstream events with the finalists already guaranteed their places in the national finals at Leamington which begin at the start of next month, but the honour remains of heading there as county champions. The semi-finals were completed at Parkway at the weekend during which Stuart Popple (Parkway) and Simon Leader (Warboys) booked their places at Leamington in the two-bowl singles after wins over Brian Martin (Parkway) and world indoor number one Nicky Brett (Warboys) respectively. It’s a two-bowl singles double for the Leader household, with wife Karen (Sawtry) having qualified in the women’s event. 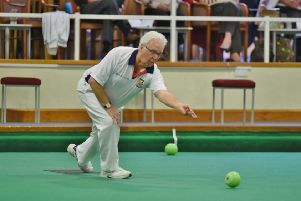 Popple’s wife Catherine (Parkway) has qualified for Leamington in three events – four-bowl singles, pairs, and fours. Nicky Brett will be playing on the next rink to daughter Chloe when he competes in the triples final, Chloe facing defending junior international Hannah Overton (Parkway) in the under 25 singles. 10.00am: WOMENS TRIPLES: Pat Reynolds (Parkway) v Linda Darani (City of Peterborough). MENS PAIRS Lewis Baker (Warboys) v Andrew Thurston (Parkway). 10.30am:WOMENS 4b SINGLES:Juliet May (Buckden) v Catherine Popple (Parkway). MENS 2b SINGLESStuart Popple (Parkway) v Simon Leader (Warboys). 1.00pm: CHAMPION OF CHAMPIONS: Owen Darlington (St Ives) v Trevor Collins (Parkway). WOMENS 2b SINGLES: Juliet May (Buckden) v Karen Leader (Sawtry). MENS TRIPLES: Stuart Popple (Parkway) v Nicky Brett (Warboys). WOMENS U25 SINGLES: Hannah Overton (Parkway) v Chloe Brett (Warboys). WOMENS PAIRS: Catherine Popple (Parkway) v Val Newson (Parkway). 2.30pm: WOMENS SECRETARY SINGLES: Juliet May (Buckden) v Vie Hatch (West Ward). MENS 4b SINGLES: James Bowers (Sawtry) v Ed Elmore (Warboys). 4.30pm: UNDER 18 SINGLES: Jack Squire (Buckden) v Chloe Brett (Warboys). MENS FOURS: Simon Leader (Warboys) v Barry Kitto (Brampton). WOMENS FOURS: Catherine Popple (Parkway) v Angela Kenny (Parkway). STUART & CO SHIELD: Somersham v Sawtry. MEN’S 4b SINGLES: Ed Elmore (Warboys) bt Nigel Eagle (Parkway) 21-11. MEN’S 2b SINGLES: Simon Leader (Warboys) bt Nicky Brett (Warboys) 16-14; Stuart Popple (Parkway) bt Brian Martin (Parkway) 18-6. MEN’S PAIRS: Andrew Thurston (Parkway) bt Trevor Collins (Parkway) 19-7; Rob Elmore (Warboys) bt Nicky Brett (Warboys) 16-14. MEN’S TRIPLES: Stuart Popple (Parkway) bt Lee Swannell (Warboys) 17-7. MEN’S FOURS: Simon Leader (Warboys) bt Rob Elmore (Warboys) 21-17; Barry Kitto (Brampton) bt Neil Wright (Parkway) 20-13. WOMEN’S 4b SINGLES: Juliet May (Buckden) bt Judy Ford (Yaxley) 21-12; Catherine Popple (Parkway) bt Jenny Harvey (Parkway) 21-4. WOMEN’S TRIPLES: Pat Reynolds (Parkway) bt Catherine Popple (Parkway) 20-11; Linda Darani (City of Peterborough) bt Julie Masters (Parkway) 24-11. WOMEN’S SECRETARYS SINGLES: Juliet May (Buckden) bt Freda Thomas (Yaxley) 21-9; Walkover: Vie Hatch (West Ward).